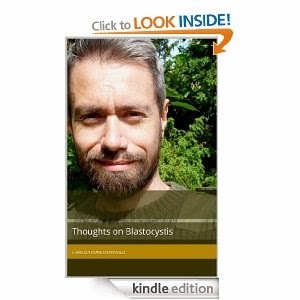 My 'Thoughts on Blastocystis' now as eBook in Amazon! I edited and assembled quite a few blog posts and published them as the eBook Thoughts on Blastocystis in Amazon! Buying it will set you back only about one pound, and even if you're completely broke, you may be able to borrow it through the Kindle Owners' Lending Library service. How cool is that?! Anyway, the book summarises a lot of facts, thoughts, hypotheses and new research data on Blastocystis with a personal take here and there and also with parallels to other areas of clinical microbiology, gastroenterology and microbiomology. I hope you'll enjoy it! Please also note that our review 'Recent Developments in Blastocystis Research' published in Advances in Parasitology Vol. 82 is also available for purchase in Amazon.